As I start to type this it is the middle of March 2017. With 4 weeks to go before we leave for overseas there is a lot for me to do. But before I get to that, let me share with you what is new in my kitchen. When I did the post on how to bone fish I realized I had not shared a photograph of the boning tweezers I bought for Dave. This is one job I usually delegate to him to do. I read about these markers a couple of years ago and have been looking out for them since then. I was tempted to send my mother shopping in New York when she was there. But she did not have much time for such errands. A few weeks ago I was at a local shop looking for embossed sous vide bags when I came across these. 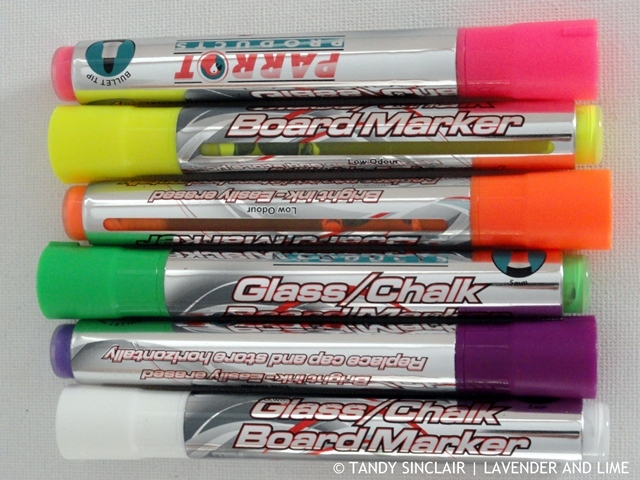 They are perfect for writing on glass and plastic. The ink comes off with the wipe of a wet cloth. 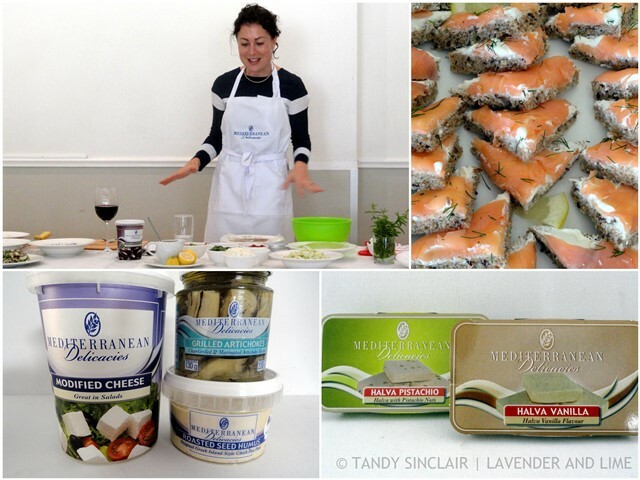 Mediterranean Delicacies recently invited me to a demonstration and luncheon at The Greek Club Restaurant in Cape Town. Kate Liquorish showed us a few great recipes including one for Halva Mousse/Semifreddo. To make the mousse all you need is 100g Mediterranean Delicacies Pistachio Halva, 125mls Cream Cheese and 250mls Whipping Cream. As we were allowed to choose what we took home with us I made sure halva was on the list. I also took some Danish style feta cheese, grilled artichokes and roasted sesame seed humus. 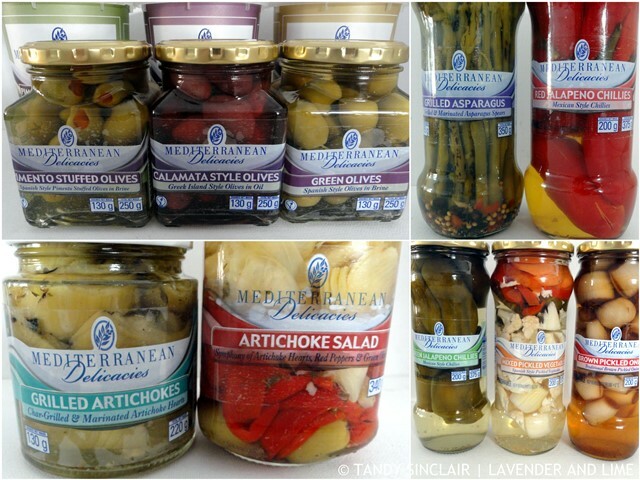 For being so enthusiastic I won a hamper full of goodies including 3 types of olives, more halva, more artichokes, grilled vegetables and jalapeno chillies. 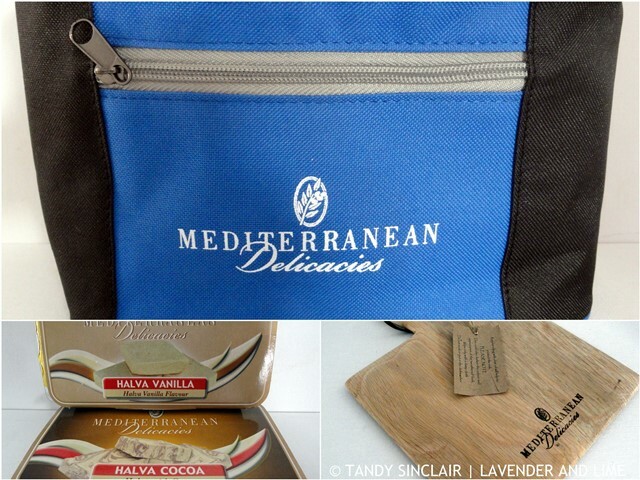 Also included was a wooden board which is on our dining room table, and a cooler bag. The one we have been using for our travels was looking very sad so I tossed it out and we will take this one with us. My friend Rosey came to stay with us for a weekend. She gifted us these beautiful salad servers with elephants depicted on the handles. Quite something special as the first time I ever saw an Ellie in the wild was when I was with her in Zimbabwe. Dave and I were given a Bosch Coffee Bean Grinder for our wedding as a gift. It was well used as a spice grinder for many years until the motor broke. I decided to get the Breville Spice Grinder as it is easier to clean and has a better capacity than the others on the market. I am well pleased with the grinder which I know will get a lot of use in our house. Dave has been looking for a digital thermometer where you keep the temperature unit with you and the probe plugs into the stand. Not being able to find what he was looking for, but stumbling across something similar I took a photograph and emailed it to him. He told me to go ahead and buy it, even though it connected to a smart phone via an App. For those of you who know Dave, he is AppPhobic. 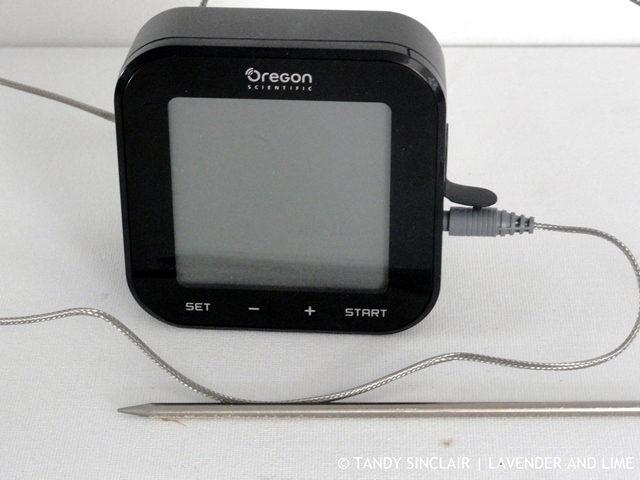 I bought the Oregon thermometer and when Dave saw it he asked me to return it to the store. I had full intentions of doing so, but the monster dog AKA Scarlett ate the box. So we are stuck with it. And the App does not work on my iPhone. I have been most frustrated with all the repeats in the monthly #FOMO boxes and I am happy to report that the March 2017 #FOMO Box was not too bad. I am looking forward to trying the beer biscuits and even though I am not a fan of polenta it will be used at least once. The wine is always welcome (especially as the tail of the monster dog knocked over a bottle last week!). I have started using more balsamic vinegar in my cooking to use up what I have been sent and purchased. The marmalade will end up being gifted and the jam used. I am linking up with Liz who hosts the monthly In My Kitchen series. 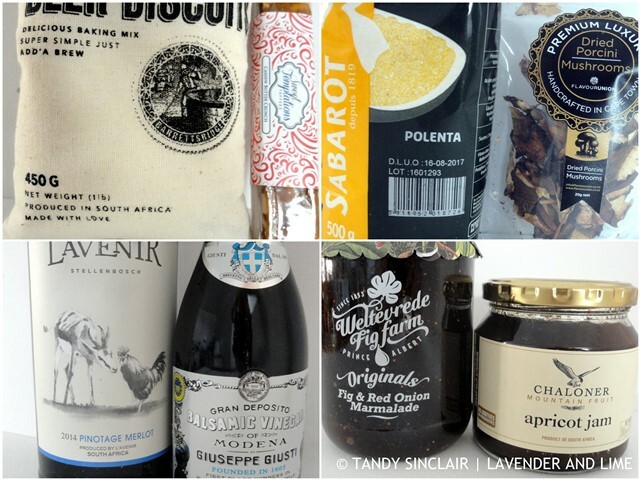 Tandy, what a wonderful hamper of goodies you brought home! I’m partial to artichokes, too. Thanks for your tips on boning fish and for your salt encrusted recipe. My husband does a great job cleaning fish, but every once in awhile I run across a bone. Those tweezers sound handy. Will have to try your recipe next time he reels one in! (Or maybe I need to get out my fishing pole?) Have fun on your travels! What a lovely hamper you won. I have chalk markers as well and just love them, so handy in the kitchen. I own quite a few global knives and I really love them. I really should invest in boning tweezers. 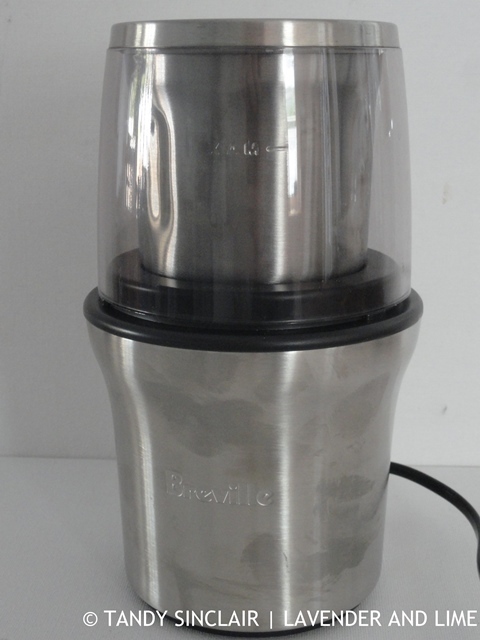 I also have a breville spice grinder and it is super handy. I love reading about your stories, Tandy! Loads of lovely things to check out Tandy! Those artichokes sound particularly good. what a shame about the thermometer! it looks a bit tricky. 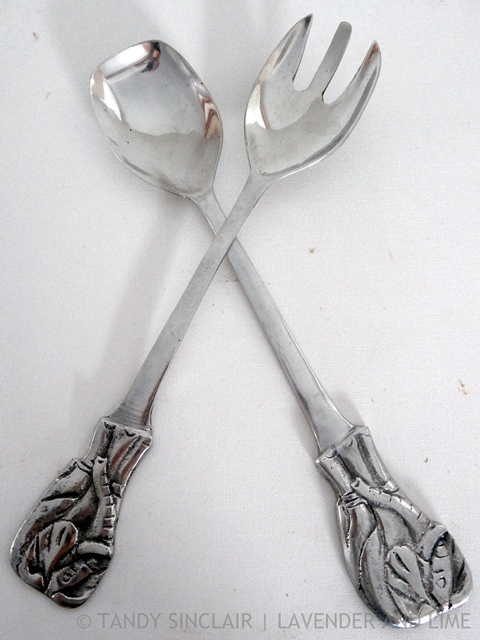 :) love the elephant salad servers – very pretty. that spice grinder looks very effective. i am still using my ancient old coffee grinder for spices. so handy. hope to see you next month for IMK! I am having lots of good times eating it all! Hi Tandy, wow! you have some new great stuff, love the salad servers, too bad your box was destroyed, on puppy is now 9 weeks old and she is adorable but a little monster as well. Please share a photo of the puppy! I could not cope with a 9 week old again so good luck! Lots of great stuff! 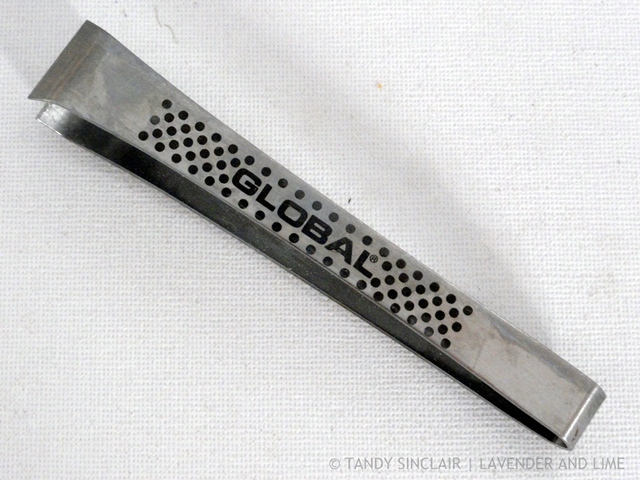 LOVE Global I have 2 knives. And that si too funny only found out about chalk markers recently for a DIY scratch of map of the world project.